Sacramento Regional Transit is committed to providing accessible, reliable, safe and convenient transportation to persons with disabilities and seniors. Insuring all riders equal transportation opportunities is the focus of SacRT’s Accessible Services Department. SacRT affirms the principals of equality and inclusion for persons with disabilities as set forth by the Americans with Disabilities Act (ADA), which includes access to public transportation. 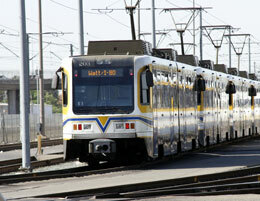 SacRT is committed to providing safe, reliable, efficient, accessible and user-friendly services to its customers. To ensure equality and fairness, SacRT is committed to making reasonable modifications to its policies, practices and procedures to avoid discrimination and ensure programs and services are accessible to individuals with disabilities. Requests for modifications can be made by calling SacRT at (916) 557-4545, or by emailing customeradvocacy@sacrt.com. All SacRT buses are low floor vehicles equipped with ramps and a kneeling feature that allows the bus operator to lower the bus. The ramp is deployed for patrons using mobility devices, as well as for persons with mobility related issues. (Please note: Buses operated by the Community Bus Service Division are equipped with lifts, not ramps.) If you do not use a mobility device, but would still like to use the ramp or need to have the bus kneeled to facilitate your boarding or exiting the bus, make sure to notify the operator. Your safety is our first priority. The mobility device securement area has space for two mobility devices. SacRT bus operators are required to fully secure all mobility devices before proceeding with the approved system on the bus that is solidly attached to the floor of the coach. Both mobility device positions are equipped with safety lap and shoulder securement straps. SacRT recommends users of mobility devices wear the lap and shoulder belt provided as part of the securement system, which the bus operator will help you with upon request. The seat belts are intended to give additional stability and bracing opportunity in the event of unforeseen sudden stops or other bus movements. Patrons may also request assistance from the bus operator with boarding and exiting the vehicle, repositioning the bus if there is an obstruction at the bus stop, inserting fare payment or swiping/tapping fare media at the fare box. Scooter type mobility devices (three-wheeled scooters) are top heavy and may become unstable during transport. For your safety, it is recommended that you transfer off your scooter and onto a bus seat. By law, seats at the front of the bus are designated as priority seats for persons with disabilities and seniors. Announcements will periodically be made to request that other passengers vacate the priority seating. Federal law requires that operators request passengers (who are non-disabled) to vacate priority seating when needed. *A "Wheelchair" or a "Mobility Device" is defined as a mobility aid belonging to any class of three-or-more wheeled devices, usable indoors. Stop announcements are provided for the benefit of all SacRT customers, including passengers with visual impairments. Vehicles are equipped with automated announcements that activate at the route stops to inform passengers of the bus location. Announcements are also made at frequent intervals to notify passengers of approaching stops, transfer points, major intersections, destination points and intervals along the route. In addition, all specifically requested stops will be announced by the operator. External stop announcements also identify the route at all stops. If this system is not available, or is inoperable, then the operator must use the internal and external announcement feature of the on-board public address (PA) system. If neither alternative is available or operable, then the operator must make these required announcements using his or her own voice loudly and clearly. All light rail stations have ramps or lifts for mobility device accessibility except the 12th & I Station where only north-bound trains to Watt/I-80 are accessible. Please allow enough time to reach the waiting area at the top of the ramp or lift before the train arrives. To assist visually-impaired passengers, there are detectable warning tiles and door indicators at all light rail stations. Stations and vehicles contain raised-print and Braille signage, and fare vending machines are equipped with tactile and audio instructions. If you need assistance or a demonstration regarding accessible features of SacRT light rail vehicles, call SacRT's Accessible Services Department for information at (916) 557-4545 or by emailing customeradvocacy@sacrt.com. Move your mobility device to the top of the boarding ramp and stop behind the yellow detectable warning strip. Please allow enough time to reach the waiting area at the top of the ramp or lift before the train arrives. After the train has stopped, the operator will open the door and lower the access platform. Inform the operator where you want to get off, and if all spaces are taken and you will need assistance to exit. Move to the designated mobility device area and secure your brakes. If you are in the entryway, please back up to the train operator’s compartment wall and set your mobility device brakes. If you board a CAF light rail vehicle, with the wider aisles, and are riding in the rear of the car, please start moving forward to the exit prior to arrival at your stop so you are prepared to de-board. Two seats at the front of the first light rail car are designated as priority seats for persons who are disabled and seniors. Federal law requires that operators request passengers (who are non-disabled) to vacate priority seating when needed. Each stop is announced in every rail car. SacRT is committed to taking reasonable measures to ensure all members of the public are able to utilize SacRT’s public transportation service and facilities with ease and comfort. Service animals provide important assistance to individuals with disabilities and are welcome at SacRT facilities and on board SacRT buses and light rail vehicles. A service animal is a guide dog, signal dog, or other animal individually trained to work or perform tasks for an individual with a disability. An individual may have more than one service animal. A SacRT representative may ask (1) if the animal is a service animal required because of disability and (2) what task the animal has been trained to perform. However, a service animal requires no special tag, identification, certification, papers, harness, vest, cape, or pass. A service animal must always be under the control of the handler. A service animal must be harnessed, leashed, or tethered unless these devices interfere with the service animal's work or the person's disability prevents use of these devices. In that case, the person must use voice, signal, or other effective means to maintain control of the animal. SacRT may refuse to transport service animals that are deemed to pose a direct threat to the health or safety of drivers or other riders, create a seriously disruptive atmosphere, or are otherwise not under a passenger’s control. An individual is not denied access if their service animal is denied access. What are examples of specific work or tasks that service animals are trained to perform? Emotional support, therapy, comfort, and companion animals are not service animals. “Emotional support, therapy, comfort, and companion animals” refer to when an animal’s only function is to provide emotional support or comfort just by being with a person. Such animals do not qualify as service animals under the ADA because they have not been trained to perform a specific job or task. Are non-service animals allowed on SacRT buses and light rail vehicles? In accordance with SacRT’s Ordinance Prohibiting Specific Acts Committed In or On RT Vehicles or Facilities, non-service animals are permitted on SacRT vehicles if the animal is: (1) in a completely enclosed and secured cage or carrying case which is small enough to fit on the person’s lap; and (2) the animal does not otherwise endanger or annoy other persons. Violations of SacRT’s rules for transporting non-service animals are subject to a fine not to exceed $75 for the first offense and $250 or community service for subsequent offenses. If you have a disability and the format of any material on our website interferes with your ability to access some information contained on our site, please email to webmaster@sacrt.com. The webmaster will refer your request to the appropriate Department or program for assistance. To enable us to respond in a manner that will be of most help to you, please indicate the nature of the accessibility need, your preferred format (electronic format, large print, etc.) the web address of the requested material, and your full contact information so we can reach you if questions arise while fulfilling your request. 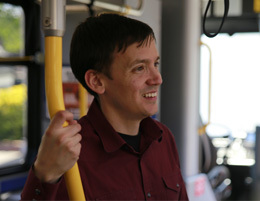 Most individuals with disabilities are able to utilize SacRT’s fully accessible system. ADA paratransit service is designed as a limited “safety net” of services that are required as a matter of civil rights to ensure access to public transit. SacRT provides door-to-door, shared ride, ADA paratransit service for individuals who are prevented from using SacRT buses and light rail due to a disability. Riders must meet the ADA eligibility requirements to qualify and must complete an eligibility process in advance with SacRT, to determine if the applicant qualifies for ADA paratransit service. ADA paratransit operates seven days a week, including holidays and mirrors service within a ¾ mile radius of an active SacRT route or light rail station. When taking an ADA paratransit trip, you should allow as much time from the origin to the destination as the same trip would take using a SacRT bus and/or light rail train, this includes time to get to the bus stop and transfers. Exact fare of $5.00 for each one-way trip is required upon boarding; drivers do not give change. Two limited ride paratransit monthly pass options are available, each cost $137.50. Click here to download the ADA Paratransit Interactive Application* SacRT's ADA paratransit Service documents are presented in Adobe Acrobat format. To download and install the free Acrobat Reader please visit the Adobe site. If you would like a copy of the application for ADA paratransit services, please contact us at (916) 557-4685 or (916) 557-4686 TDD or by e-mail paratransit@sacrt.com. Please let us know if you need the application in a different format, such as Braille, large print, disk or Spanish. This application form is in Adobe PDF format and must be downloaded to become interactive. For best viewing and full function of the application, you must use Adobe Acrobat Reader (v.8 or better), which is free for download. Once Acrobat Reader is installed, you can simply click on the link, open the file, drop your curser in the first highlighted field and tab and mouse click through the fields, filling out the form as you go, printing the pages from your computer. The filled out information can now be saved in Acrobat Reader to your computer, so you can save the information and return later to finish filling out the form. Please note that the last two pages must be printed blank and filled out by a medical professional.